Ambassador Kt Miller discusses her ski/climate change documentary, available for your viewing pleasure. Photo courtesy of Kt Miller. For two years Kt Miller was a helicopter skiing guide helping clients use the fuel-hungry machines to reach the top of mountains. After learning more about climate change and seeing the effect it had on the mountains around her, she quickly lost her fondness for the business and the obscene amounts of fuel the helicopters consumed. Miller made a choice. She cut back on travel that hurt the environment and focused on sustainable living. She now resides in a single-room 14-by-12 foot cabin in Cooke City, Montana, population 76. She tries to travel using sustainable methods wherever possible and hasn’t been on a helicopter since she left her job. Now she focuses on making awesome ski videos while bringing the plight of the climate into the public’s eye. On one of her more recent expedition, she and four women embarked on a human- and wind-powered trip to the western coast of Greenland to document the effect climate change has had on the ice sheet in the area. They also skied multiple first descents along the coast to help motivate snow sport enthusiasts to get up and do their part to conserve winter landscapes. Now that the trip has finished and her documentary about the adventure is being shown across the world, we took some time to ask Kt Miller a few questions about her new documentary, “Shifting Ice + Changing Tides,” and the experience she had during the filming process. 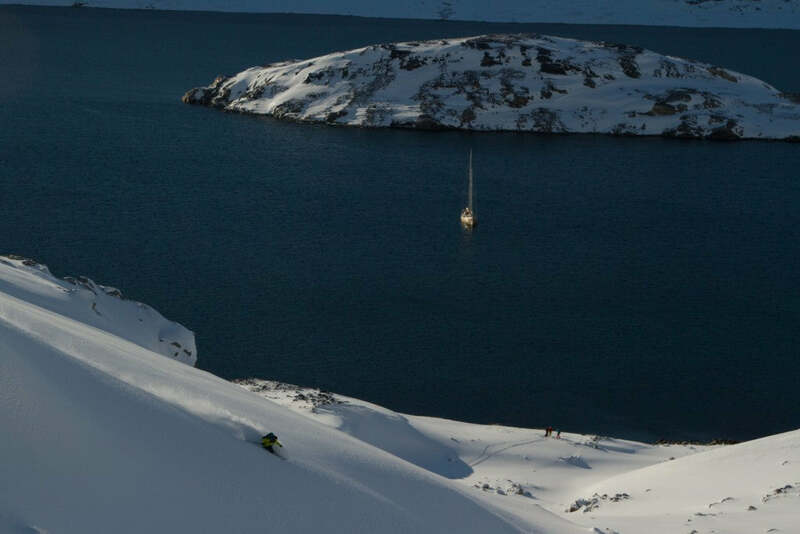 Nat Segal skiing perfect powder in West Greenland, with the La Louise sailboat below. Photo by Kt Miller. What a novel idea—marrying your passion for climate change with skiing. When, why and how did this film come about? It was really one of those magnificent accidents. Kind of like they famous saying, “luck is when preparation meets opportunity.” I saw the website the ladies put together for their trip and was super jealous and pretty much drooling over it. It was sort of my dream trip: combine my passion for the Arctic, with the knowledge I gained working for Polar Bears International, my love of photography & storytelling and skiing… in Greenland. But when I first heard about the trip they already had a different photographer and filmmaker lined up that was sort of a badass, super well known, National Geographic photographer— so I pretty much thought it was out of my league and I would just watch and drool from afar. Then the other gals had trouble fundraising enough $$ to pay him, and asked if I would come in a pinch. I, of course, jumped at the opportunity, and three weeks later departed for Iceland having only really met and skied with one of the women before. It seemed serendipitous since they really wanted an all female team, and when I jumped on board it made it a team of six women, instead of five women and a male photographer. Meghan Kelly dreamt up the trip initially. 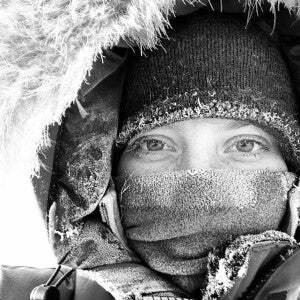 She send out an email to a bunch of friends basically saying— “Hey, I want to go on one more epic adventure before I have kids, and I’m going to apply for a Polartec grant. Who’s in?” Nat Segal, Pip Hunt and McKenna Peterson responded, and the dream began to become a reality. They all sat down and looked at a map and started brainstorming and just sort of decided on Iceland and Greenland. It was instantly obvious that sailboat would be the preferred method of travel, and it seemed that if they were going to Greenland, climate change needed to be a part of the story. The biggest issue then, was that no one had substantial sailing experience, so they reached out to Pip’s mom Martha, a master-yachtsman, to see if she might be keen to come along. From there they divided and conquered. Meghan spearheaded the finance, Nat captained the media (website, Facebook, outreach, etc. ), Pip worked on pitching the story, McKenna researched terrain and Martha looked into everything related to sailing. My role was to document the trip with both photos and video. The fact that I had a background in polar bear conservation, knowledge of traveling in the Arctic and past experience guiding, was a bonus. 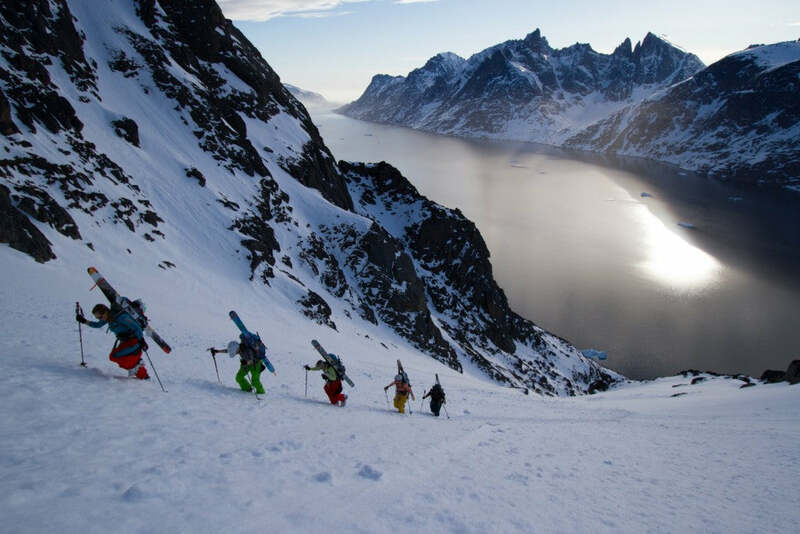 The Shifting Ice team, Pip Hunt, Meghan Kelly, Martha Hunt, McKenna Peterson, & Nat Segal climbing up the first ski line in South Greenland. Photo by Kt Miller. Seems like this was a big next step for you as far as your career in photo/filmmaking goes. What inspired you to go to the next level? How difficult was the process? Where do you think it took you? This project pushed me so much more than I ever thought or expected it would. It is the hardest thing I have ever done. There are so many things I wish I knew before I started, but I learned a TON and grew a ton as an artist, storyteller and filmmaker. I don’t know that I would say I knew it was taking me to the ‘next level’ or pushing me in the ways that it did until after it was complete and I had time to reflect. When you are in the middle of a process or experience I think you often don’t realize how much it is transforming you. I also didn’t really think too much about what an accomplishment this would be among the outdoor women’s world (there are very few films completely made by and starring women pushing boundaries)— I just knew I had to get it done, and I sat down and worked. I look back on the footage now and I see the stress and the fear in my face, I see the focus, I see seasickness, I see the struggle. But at the time, I was just doing, because that’s what had to be done. I’m not sure exactly where I am at now in my career, but I’m really excited to work on some more film projects with the massive amount of knowledge and experience that I have gained. I’m excited to take my skills and push them to the next level, and now I actually know (or think I know) what that level is. What are some of the most important lessons you learned while making this film? About working with people? About telling a story? About making a film? Wow, I learned so many lessons. It’s hard to pick a few. I learned the importance of feedback and reaching out to people outside your comfort zone and outside your normal audience for input. Someone who skis a few days a year and lives in NYC is going to have a way different perspective than your mom, or your coworker who skis with you all the time. I learned that you can’t force the editing process, but it is important to block out time, turn off the Wi-Fi and say I’m going to sit down and edit, even if I don’t get anything done. It’s sort of like writing. If you sit down and start writing, even if it is junk, eventually the thoughts will start flowing. I learned that it’s important to film everything. During our trip we experienced a pretty severe storm and I was so scared and sea sick that I didn’t film. I wish I had dug deep and known how important that footage could have been. And overall I think I just learned the power of film. I’ve had so many people, women especially tell me how much it moved them and inspired them. What’s your ultimate goal with this film? I think my goal has changed. At the beginning I think it was more personal— I really wanted to complete the film, tell the story and push myself. I wanted to focus on the climate story that I wanted to tell. As the film has been touring film festivals I’ve seen the how many women have been inspired by it I think I am now equally focused on using the film to empower women. Is there anything I’m not asking you that you want to share with me about this process? I just want to express my immense amount of gratitude and respect to all the other ladies that were a part of this project. They put so much work into planning the trip. I am super honored to be a part of it and have the privilege of telling our story. 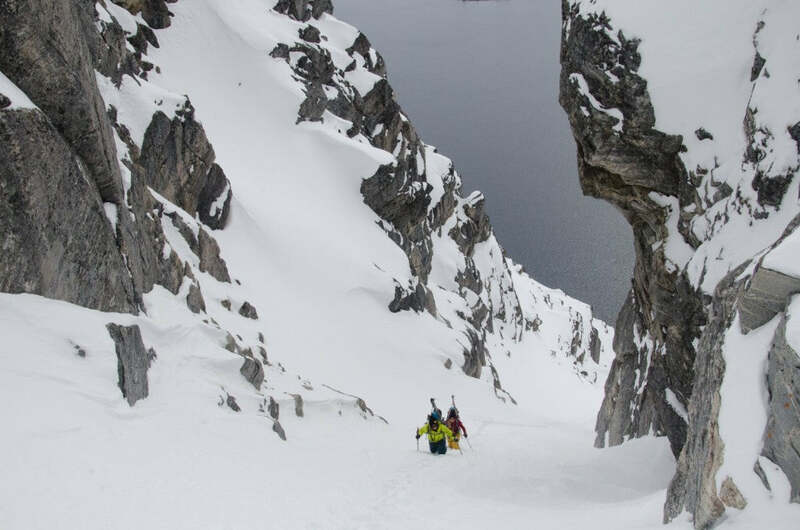 Nat Segal & McKenna Peterson booting up a beautiful couloir in West Greenland. The post Shifting Ice + Changing Tides: Kt Miller Fights Climate Change Thru Film appeared first on Hyperlite Mountain Gear Blog.